For this recipe, you really need to use a bread that stands up to the strong flavour of chicken liver. Walnut bread is ideal and it also lends a nutty flavour to the dish. Alternatively, try the fresh taste of Waitrose Organic Rye Bread - it works just as well. Preheat the grill to high. Place the pancetta or bacon on a grill tray lined with foil. Grill for 6-8 minutes until crisp and keep warm. Meanwhile, melt half the butter in a frying pan and gently cook the shallot for 5 minutes until softened. Trim the chicken livers and cut into even-sized pieces. Add the livers to the pan and increase the heat. Quickly brown the livers on all sides, then add the chopped thyme. Stir in the marsala and cook over a high heat, stirring, for 1 minute. Meanwhile, toast and butter the bread. Then add the grapes to the livers and cook for a further 2 minutes, stirring to cover the grapes in the pan juices. 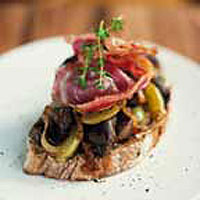 Season and serve on the hot buttered toast and top with crispy pancetta or bacon and a few sprigs of thyme.